The students of the Butler County Fire Science Resident program participated in a live burn training evolution Saturday evening. After several grass fires that day the On duty crew managed to get some quite time from the pagers to participate in the training. Crew members got practice pumping the truck while the students received nozzle time. Jalis Bullock, Broc Adams, Logan French, Ethan Herrick, and Gage Merutka all showed up on their own time to gain realistic training and experience. Special thanks to Chad Wittenberg for capturing the moments. Thirty-six years ago a big share of firefighters smoked. As well it wasn’t uncommon for a crew to make an interior structural fire attack without an air pack, exit the building in a major coughing fit, then pull out a pack of Camels and light up. It was also a tough time for those who didn’t smoke, but not just in the field – it was tough in the fire station. Smoking was allowed everywhere. It wasn’t uncommon for a firefighter to finish his dinner quickly and light up a cigarette while others were still eating. If you complained the smoker might just take a big smoke inhalation, then blow the smoke in a whirlwind stream directly at you. It would be a good guess that between fighting fires and second hand smoke, non-smoker firefighters were taking in the equivalent of a good three pack a day smoker. I can only hypothesize the strength of the habit of smoking having never been a smoker. I suppose the smoking in some way helps relax a person during down time awaiting a response. 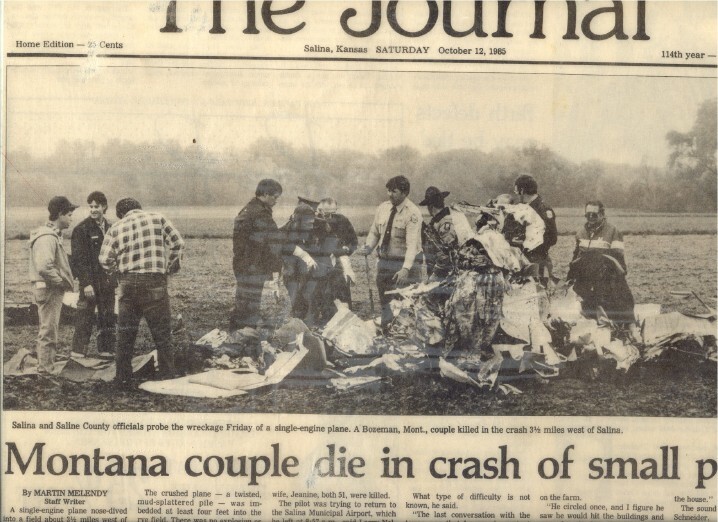 This all changed for Salina firefighters in the fall of 1980. I was driving home passing under the water tower on Belmont Street after working a shift at the fire department. I had the radio on and the news was playing. The news person cited a New England Journal article finding that non-smokers living with smokers had a 50% higher rate of lung cancer. The light went on in my head. This was not just a cleanliness issue. My next shift at the fire station I loaded up the electric typewriter and wrote a petition – a No Smoking petition. Now it was time to circulate the petition to see how many I could get to sign it. A total of forty-two signatures was attained. The surprising thing was some smokers signed the petition hoping they could kick the habit if smoking was banned. I turned in the petition to my Battalion Chief – later to be Fire Chief – Tom Girard. I was told that the petition was brought to the staff meeting. The Chief was going to ignore the petition, but Girard pointed out the liability should they ignore the petition. The smoking ban was enacted. But, not everybody was happy. There were some smokers who were enraged. To this day I’m sure some still hold a little bitterness. But, they would have to be bitter towards a much larger crowd, since smoking bans indoors is the norm for all government buildings today. The “Undersigned” were simply early trailblazers. Butler County firefighters fought several range land fires this afternoon. The first fire was at NE 69th Terrace. It took three departments to control – keeping it from jumping the Turnpike. A small shed was lost, but several other structures, including a home, were spared. LJ is married and his wife and him have two children, Porter 6 and Hillery 4. LJ comes to El Dorado from Elk City, Oklahoma. He has two sisters, Dawn Oberheim who lives in Garden City, KS; and Jill Tanner who lives in Wichita. His hobbies include his family, hunting, golfing and landscaping.